Fight Entropy: Quick Hit: "The Long Island Express"
If you had already been advised that Long Island was close to perfection on earth, that we had no worries about floods, earthquakes, hurricanes or other natural disasters that had befallen other unfortunate parts of the earth, the chances are pretty good that you could have gotten fooled on the 21st day of September, 1938. The hurricane was a Category 3 on the Saffir-Simpson scale when it made landfall (after peaking at Cat 5 out to sea) and devastated much of eastern Long Island and the south New England coast. 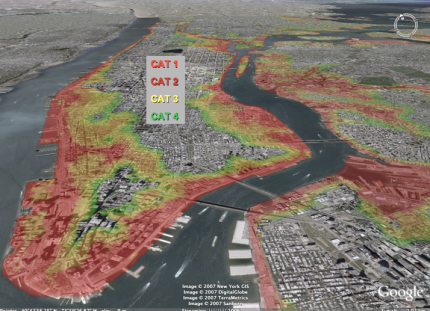 Wind damage in New York City wasn't extreme but flooding was (viz the photo above). Of course, this wasn't the only major hurricane to hit New York City; the 1893 Hog Island Hurricane, for example, is so named because it washed away most of Hog Island in between Long Island and Long Beach. More generally, this is a tidy, local, little example of one of the fundamental problems with disasters, namely that we often generalize about dangerous events over a period of time (e.g., the lifespan of a high school student) much shorter than the average amount of time between those events. 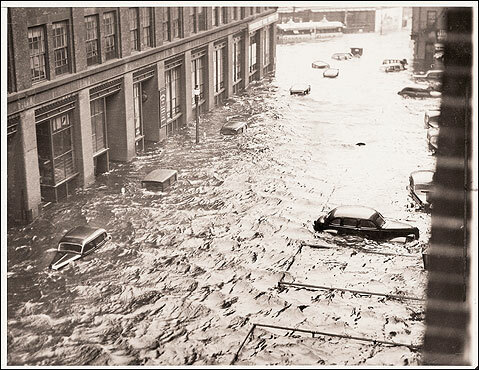 New York City seems from casual remembrance to be at no serious risk from hurricanes, but looking at past history indicates that we will surely get hit by a big one sometime sooner or later. And it's certainly better to accept that risk and prepare for it than otherwise. Some more resources on the LIE Hurricane can be found here, and PBS actually has a documentary about it here. That was an interesting walk through history.